If you have always dreamed of living in a New York loft-style apartment, well how about getting married in one? The industrial interior trend took us by storm a couple of years back, and soon enough sneaked it’s way into the world of weddings. The movement features minimalist thinking, raw materials like concrete, copper, pallet wood, brick, exposed light bulbs and rough elements like raw wood and various metals. Anything that you would find in a factory pretty much. It opens doors to weddings like we never saw them before. 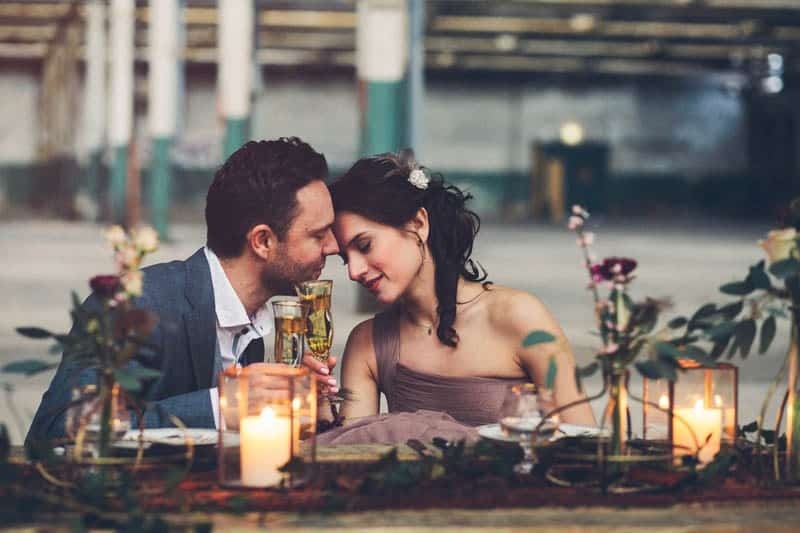 The industrial wedding theme lends it self especially well if you want to have a wedding which is non-fussy, not-vanilla and not to mention affordable and – with a dash of ingenuity – comparatively easy to pull off. Vintage: done in a vintage factory style: think old signs, brass or other metal components and well worn French style furniture. Or: Farm-style; rusted farm tools, equipment and printed Hessian sacks. And Elegant: find an abandoned factory space, adorn it with mixed metal hues, glitter, antique rugs, chandeliers, classy chairs and table decor. You can work industrial elements into any contemporary wedding day to give it an refreshing edge in either direction: industrial-glam, industrial-modern or industrial-rustic. Choosing to go industrial opens so many new possibilities for finding unique venue spaces and creating unexpected event designs. The concept creates a magnificent juxtaposition between hard, raw, masculine elements, with the romantic, flowy, soft, flower-y vibes that are normally attached to a wedding. Doing your wedding in this way makes for a very interesting decor and really impressionable atmosphere. Some years ago it was regarded as a weird subculture (“weddings in a warehouse – wtf? ?”) but with “hipsterism” brought into the light as the urban pop culture of choice, having now been somewhat commercialized and well established as a style trend, avantgarde industrial weddings have become accepted and more and more frequent. And that is a wonderful thing, if you ask me. I guess it reflects the times we are in – a time when we feel the need to simplify, be more frugal, and make use of material readily available, thus it make sense to take these ideals through to our weddings as well. Perhaps a time when we feel a need to put our own individual stamp on things, too. With a little bit of imagination and out-of-the-box thinking you can create a unique wedding just about anywhere. Look around for an empty warehouse as a venue, use your imagination and be creative (but sparse) when it comes to your decorations. For the ceremony, scatter green foliage on the floor or hang it arranged in an arch for a back drop, add candles and string lights, and that should be all you need. What is really to love about this style is that one can be incredible creative with your wedding decoration, even use materials from your tool shed, recycling bucket or nearest hardware shop. As the components are quite heavy and robust, the theme is very well suited to be minimalist; less is more when it comes to styling, which is another reason it is more friendly to the wallet than it would be to put on a ball at a chateau. To easily create the industrial look, incorporate items such as copper piping, ladders, wine barrels, Edison-style light bulbs, cinder blocks, tin cans and why not play around with concrete; cast candle holders, table numbers, or plant pots for succulent favours. For the reception decor you can just ask your dad if you could dig in his garage, head to the scrap yard with your groom for table decor and photo booth props, and ask your bridal party to help you gather old tin cans and bottles to use as vases and candlesticks. Up-cycling does not get any better than this. The industrial style combines very well with geometric shapes, for example copper piping bent into diamonds, napkin rings, incorporated into your clothing; or why not build your ceremony arch out of it? To soften the harsh warehouse environment, you can create a wonderfully romantic atmosphere with draped white fabric, suspended string lights, block candles, and green foliage. With bit of out-of-the-box thinking, you can create a unique wedding just about anywhere. But you don’t necessarily need an old warehouse to have an industrial wedding. Any venue, whether it is a well established wedding venue, backyard or destination venue, can achieve an industrialized look with help of a few well composed key features. A pallet wood sign, marquee letters, aluminum chairs will instantly industrialize your wedding concept. This look is extremely versatile and is perfect for couples who just wants to be different from the norm, de-clutter and re-organize the general idea of weddings and make a style statement. It is far from the cookie-cutter traditional wedding but yet very elegant in its own unique, raw and minimalist-chic ways. But you don’t have to feel held back either; incorporate some divine flowers in jewel tones, add some fresh botanical, midcentury sofas and elegant candelabras, and your wedding is instantly updated to 2017 latest wedding fashion. Your guests are guaranteed to be wowed. Next Free Awesome Hipster Wedding Fonts!